Phase 1 of our mission partnership focused on spreading the Gospel and engaging in mercy work. Over the past two decades, we’ve deployed multiple missionaries, pursued mercy projects, sent Kansans on short-term mission trips, and offered financial support and prayer. 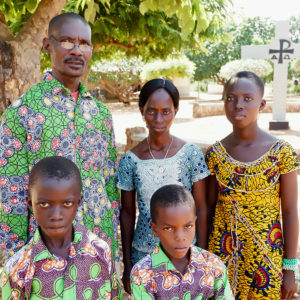 Workers in Guinea have established churches and preaching stations, baptized believers, and encouraged evangelists. Please keep these students, our church workers, and the people of Guinea/West Africa in your prayers. The Lutheran Center for Theological Studies (CLET) provides seminary education for students from countries in West and Central Africa, including Togo, Benin, Burkina Faso, Ivory Coast, Guinea, Republic of the Congo, Democratic Republic of the Congo, and Burundi. The first pastors from CLET, five men from Togo, were ordained in 2002. The typical course of study at the CLET is three years of seminary training and two years of vicarage. For a vivid look at life at the CLET, check out the article, “A Moment Decades in the Making,” in the online edition of Lutherans Engage the World. 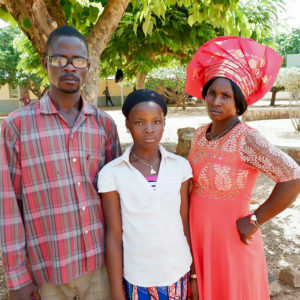 Prospère Lamah Foromo, pictured at left with his wife and daughter, is a recent convert to the Lutheran faith. He began attending Lutheran services in 2011 and was baptized and confirmed in 2014. 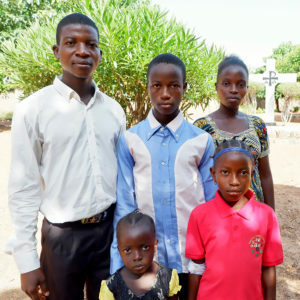 After completing his seminary studies, Prospère will return to his home region, where there are 13 congregations and 10 preaching stations but no ordained pastor. He speaks four of the seven languages of his region (and part of another), which will enable him to reach out to many people in their birth language. The CLET welcomed Moïse Théa (Moses in English) and his family in the 2017-18 school year. Moses’ story is quite unique, as he was a soldier during the war across the border in Liberia. He lost his brother in the war and was himself shot but survived. He knows French, English, and two other local languages. Now, he desires to proclaim the Gospel which sets people free. 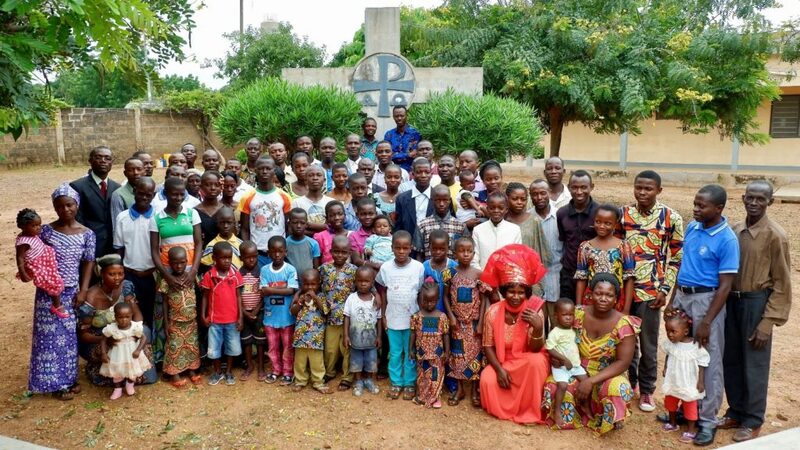 Below is a “Who’s Who” of mission personnel working with in French-speaking West Africa through the LCMS Office of International Mission. We thank them for keeping us informed about what’s happening in the field and pray that God would guard and protect them as they work to further His mission. To learn more about them, click on their names. 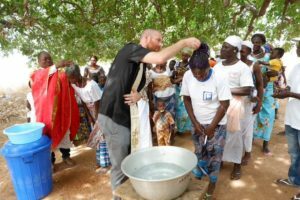 Missionaries Ryan McDermott and Micah Wildauer participated in a baptismal event at Djepiéni, a preaching station started by the evangelism efforts of Désiré Tadé many years ago. Tadé recently revived these efforts with a Togolese student, Jean-Jacques Nabe, who often bikes to the area (~10 km) to catechize the people. At this service, 65 children were baptized, and 48 youth and adults were baptized and confirmed. Long-time Guinea missionary Rev. Tim Heiney (back row in hat, fourth from right) taught a weeklong workshop at the Lutheran Center for Theological Studies (CLET) in Togo focused on evangelism and catechetical materials he developed called “The Word Illustrated” (“La Parole Dessinée” in French). 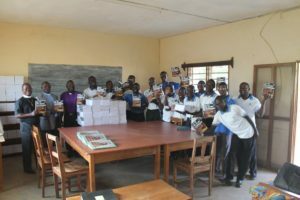 Participants received poster-sized sheets that they can use to teach the basics of the Christian faith in local language contexts with limited literacy. The CLET added 12 new dormitories to accommodate students and their families. Pictured here is the Rev. 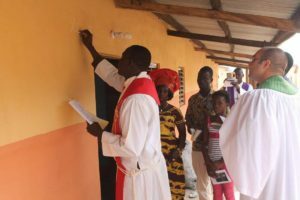 Lari Lambon, president of the Lutheran Church of Togo, writing a traditional blessing on one of the new homes in conjunction with the Service of Blessing held on January 27, 2018. We need shepherds to strengthen these churches. Now is the time. The Pentecost Offering is our major annual fundraiser for West Africa mission work. Materials (e.g., bulletin inserts, announcements, prayers) will be available in early May for congregations that plan to participate. If you’d like to make an individual gift in support of theological education at the CLET, you can donate online to “CLET Students” on the Mission Central website.